Scientists have been studying a few bones (an upper arm bone and a few back bones) discovered about 80 years ago in the country Tanzania. The bones date back to about 240 million years. Scientists believe the bones most likely belong to a dinosaur, and if not a dinosaur, then a very close relative of the dinosaur. The animal was about the size of a Labrador dog and its species has been given the name “Nyasasaurus parringtoni”. If Nyasasaurus was a dinosaur, it would make it one of the earliest dinosaur species to have walked on our planet. It would also make these bones the oldest bones of a dinosaur discovered so far. The previous oldest bones of a dinosaur were discovered in Argentina and date back to about 230 million years ago. What was happening on Earth when Nyasasaurus was walking around the planet? 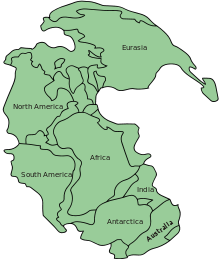 All the continents that we have today were lumped together in a supercontinent which we call Pangaea. Tanzania was in the southern part of Pangaea. Dinosaurs came into existence around 240 million years ago, and they all died around 65 million years ago. Scientists believe a giant asteroid or comet hit Earth with a massive force killing the dinosaurs. The impact caused catastrophes such as fires, earthquakes, volcanoes, and tsunamis. Large amounts of ash, dust, and other materials flew into the atmosphere, blocking out the sun for a long time. Earth became a dark and cold planet. This wiped out about half of all animal and plant species, including the dinosaurs. Well, if such a large object did hit Earth, shouldn’t there be a hole somewhere over there? It turns out there is – the Chicxulub crater in the Yucatan Peninsula in Mexico. The crater was formed around 65 million years ago and is about 180 km (110 miles) wide. It is now buried under the ground. Did you know? A newly discovered prehistoric species of lizards was recently named after Barack Obama, the president of the United States. It’s been given the name Obamadon gracilis. “Obamadon” means “Obama’s teeth,” and “gracilis” means “slender.” Obamadon had very tall, straight teeth, and along with dinosaurs, was wiped out about 65 million years ago. Did you know? Earth came into existence around 4.5 billion years ago. Here is a fun video that shows the evolution of life on our planet.